I arrived at a glum conclusion the other day. Should the Zombie Apocalypse ever come to pass—it’s really a question of when, not if—I doubt that I’ll survive it. The revelation occurred as I was watching Zack Snyder’s re-make of Dawn of the Dead late one night, just after the survivors had fled the mall and rammed their way through the mob of zombies. There is a moment when the guy who is chain-sawing through the undead slips and tumbles—saw first—into another one of the survivors. If you’ve seen it, you know it’s a real mess. Tap Your Troubles Away: This handsome fellow is one of the many zombies you defeat in The Tapping of the Dead by tapping and tapping and tapping some more. And that’s when I realized, it doesn’t matter whether you are armed to the teeth and riding in a jury-rigged mall parking shuttle through throngs of the undead. At the end of the day, you still get cut in half by a buddy with a chainsaw. The Tapping of the Dead: Deluxe Edition app for the iPhone and iPod touch only underscored my grim findings. 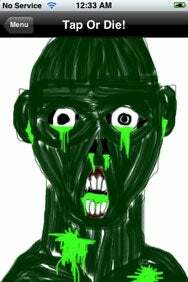 If I can’t defeat a crudely drawn, badly animated zombie by tapping my finger furiously for 12 seconds, what hope to I have against stinking hordes of the undead crashing through my patio door? The goal of Super Art Software’s remorselessly juvenile game is to “kill” zombies by tapping as quickly as possible over and over again until your index finger throbs and you can stand no more. Or after about three minutes. Which ever comes first. As the name suggests, there are no guns in Tapping of the Dead: Deluxe Edition, although there are gun sound effects. (Dear God, if this is what passes for deluxe nowadays, the zombies can have me.) No chainsaws, either. What about pickaxes, hatches or machetes? Nope. And no ball peen hammers. No garden shears. No meat hooks. No bicycle chains. Not even fingernail clippers. Just your tappin’ finger tap-tap-tappin’ away. Gameplay is ridiculously easy—tap-tap-tap-taptaptaptaptap—and I could discern no real strategy other than tapping really fast. It doesn’t seem to matter where you tap. Sometimes double-tapping helps, sometimes it doesn’t. TOD Deluxe does require a certain level of endurance. The further you progress, the longer and faster you must tap. Tapping for 25 seconds can be tiring. I suppose there could be some risk of finger injury associated with marathon play, if such a thing is possible. More bonus features become available the further the player goes on three levels of difficulty. There is a “story mode preview” and “promotional music video” that I didn’t bother to view. I mean, come on. The game tracks how quickly you defeat the zombies, and, yes, you can submit your scores and check your ranking online. The process for doing so is almost as crude as the game itself—you send an automatically generated e-mail to the developer, who adds your information to a Google database. So don’t expect to see your scores in anything resembling real time. You’ll probably be zombified before then. Through it all, try not to think too hard about how you dropped $8 on this monstrosity. Sometimes dead is better. The Tapping of the Dead: Deluxe Edition is compatible with any iPhone or iPod touch running the iPhone 2.1 software update.